Ireland is without doubt one of the finest destinations for the visitor in the world. 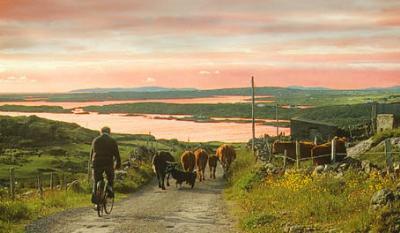 In terms of culture, history, friendliness, countryside and coastline, Ireland is simply without parallel. Known universally as the Emerald Isle due to its lush greenness, Ireland sits in the Atlantic Ocean, separated from the United Kingdom by approximately 50 miles and some 3,000 miles from the east coast of America. And while the island of Ireland may only be of similar size to Lake Superior, the Irish people and in particular the hoards of Irish emigrants, have profoundly influenced the cultural, political, historical, architectural and economical environs of the world today. Ireland (Éire in Irish) is the third-largest island in Europe. It lies on the west side of the Irish Sea, close to the island of Great Britain. It is composed of the Republic of Ireland which covers five sixths of the island (south, east, west and north-west) and Northern Ireland, a part of the United Kingdom, which covers the northeastern sixth of the island. The population of the island is approximately 5.7 million people, most of whom live on the east coast.